Consumers today are looking for a seamless, intuitive and connected purchasing experience. They want to be able to buy anything, anytime and anywhere. Braintree, a subsidiary of PayPal, makes these innovative buying experiences possible by enabling secure sharing of payment, customer and other data. Azita Habibi, leader of the Braintree Commerce Development team explains these new commerce trends, and how they boost loyalty and conversion and generate new revenue. Today, purchase opportunities are not just limited to merchant e-commerce websites. They are everywhere: in a social media conversation, an exchange on a messaging platform, a chat or an online session. Consumers want to be able to buy anything, anytime and anywhere just by clicking on the “buy button”. They want to be able to make a purchase right in the middle of a conversation. 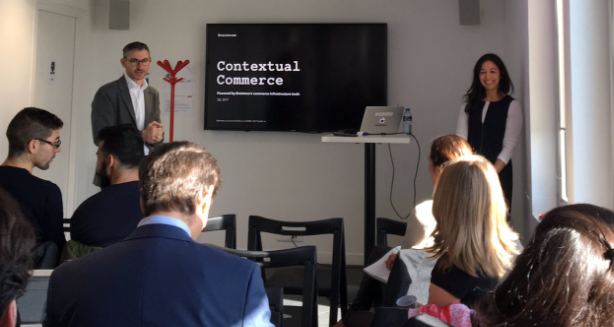 Contextual commerce enables consumers to make a transaction with their chosen brands in their preferred context (social network, blog, email…), without being taken to a payment page and suffering from friction experience. Now, they can make a seamless and smooth purchase at the moment of discovery, as payment is performed in the background. With multiple parties involved, the payment process can be tricky and challenging. Braintree, a PayPal subsidiary, has developed an infrastructure tool to address this pinpoint. “Our tools enable secure sharing of payment, customer, and other data between partners to make these new shopping experiences possible” says Azita Habibi. Braintree helps to securely share payment information between the discovery platform and the retailer. Its sophisticated tokenization offering works in the background to process payments securely and seamlessly. Braintree powers the Pinterest Buyable PINs and Facebook Messenger contextual commerce experiences with Uber, Lyft, Ticketmaster and others. By partnering with Braintree, these companies no longer need to figure out how to be paid by their customers. - Payment facilitation: to securely transmit information from the user to the partner and back to the retailer in a format that can be processed by the retailer’s existing back order flow. Ava and grace live in Singapore and are planning a vacation to San Francisci. Let's follow their journey. To find the perfect itinerary at the best price, Ava and Grace surf on a large search engine website such as Skyscanner, one of Braintree’s early partners. Often, when you find the right flight at the best price, you hit the buy button and get redirected to unfamiliar sites that generate numerous popups on your screen. Ava asks Grace on Facebook messenger if she wants her to pick her up with Uber on the way to the airport. Without Braintree, Ava would have had to leave the Messenger App, go to the Uber app to book the cab then return to Messenger to tell Grace when she will pick her up. => With Braintree, the entire Facebook Messenger experience is seamless. Facebook Messenger partners with Uber and Lyft, enabling users to order rides without ever leaving the Messenger app. Braintree’s commerce infrastructure tools enable Facebook to securely share its own stored payment data with Uber and Lyft, while ensuring that Facebook Messenger users maintain control over their information. The girls want to book a restaurant. They go onto Yelp, a US discovery platform that helps people locate great local businesses and restaurants. Yelp launched a Cash back rewards program, where consumers receive 10 % cash back on their purchases at participating businesses across the US. To achieve this, Yelp partnered with a reward platform that helped them to create these discount offers with the restaurants. In the past, they had to negotiate with each restaurant. => Behind the scenes, Yelp securely uses the forward API to share user card information for enrollment and reconciliation purposes when the user goes to the restaurant, and creates the reward point to that card. Ava needs a pair of shoes for the festival so she goes to Pinterest, her favorite visual discovery platform where she finds the perfect sandals. Thanks to Pinterest Buyable Pins, she can buy the products without ever leaving the Pinterest app. While this shopping experience is completely owned by Pinterest, the customer service is executed by the retailer. This is reassuring for the retailer who doesn’t lose the contact, and for the client who knows who he is buying the product from. Another example is Eventbrite which offers a cashless cardless festival experience. Wearing an RFID wristband, users can go to the festival and pay at any of the food and drink concessions without having to pull out cash or a credit card. By partnering with Braintree, Eventbrite grants user payment information access to each vendor. When the festival is over, they revoke the vendor access, thereby blocking further access to customer payment facilities. As clearly demonstrated in these examples, Braintree eliminates any steps that may cause a purchase delay or abandon. You enjoyed this wrap-up? Join the Entrepreneurs' Talk MeetUp group and don't miss any of our next events!